No pressure. Just the fact that they qualified is a huge success for the nation of 330 000 people. Everything above and beyond that is like an extra round of dessert. And nobody isn't going to say no to that! Once in a lifetime opportunity. These players don't get to play that kind of games every day. In fact for most of them that is a once in a lifetime opportunity and I bet each and every one from the team is willing to leave everything they have on the field and play like there is no tomorrow. But hold on - shouldn't all the athletes perform like that? National pride. I can't back this up with any research but to me it seems that the smaller the country the bigger the pride to represent it. Being a part of the squad gives you the once in a lifetime opportunity. Where as for some it is yet another game at the end of a long season. Support of the whole country. 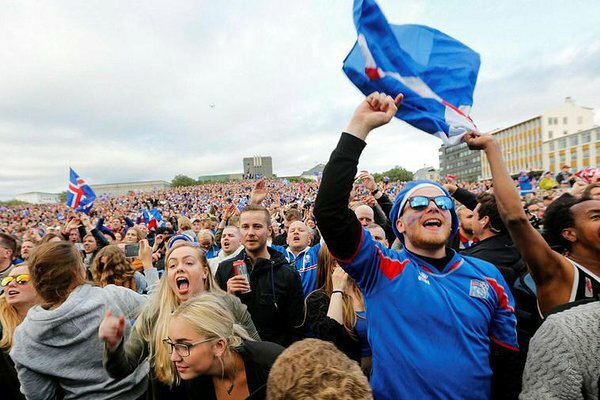 I did read from somewhere that there are about 8 to 10 thousand Icelanders in France watching the games. That is 3% of the total population. Add to that the people watching the games together in the center of Reykjavík. Now let that sink in for a moment and try to imagine being one of the players singing the anthem and knowing that these people are supporting you no matter the result. Enough motivation to do your best? To me the biggest question remains - what did coaches Lagerback and Hallgrimsson say to the players before the game in the dressing room?